40mm long final instar Xylophanes cthulhu (Sphingidae) caterpillar. Collected in Costa Rica from Janzen and Hallwachs Database. 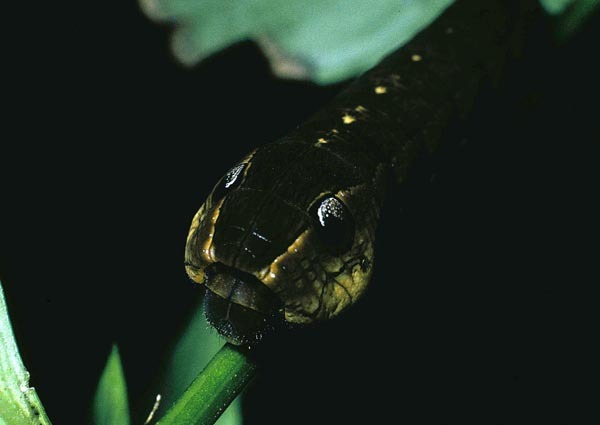 I came across a really nice piece written by Daniel Janzen in 1999 that details his thoughts about how eyespots protect caterpillars from attack by insect-eating birds. Clearly this was the draft that he later expanded into his 2010 PNAS article "A tropical horde of counterfeit predator eyes" with colleagues Winnie Hallwachs and John M. Burns. I reproduce the earlier 1999 piece here for posterity, but also because it clearly and concisely illustrates his thinking about the widespread phenomenon of caterpillar eyespots. An eye appears suddenly in the shadowy leafy world where a little bird forages. It could mean a predator close enough to strike. Flee NOW! If you pause to scrutinize for even a millisecond, you may be lunch. Imagine that you are a small bird poking your way through the foliage, enveloped in shadow, rustling leaves and strange shapes, peering here and there for an insect for lunch. Abruptly there is an eye peering directly at you from a short and unknowable distance. If you use a millisecond to contemplate whether it is snake, falcon, monkey, or cat, or caterpillar, you are lunch. It only has to happen once, and you do not realize your potential 10-20 year life span. Natural selection has hard-wired you to instantly flee when you see that eye. You "startle", and jump, fly, leap, and/or fall away from where you are. Perhaps you move only a meter or two. However, in the shadowy and confusing world of a tiny bird among thousands of rustling leaves and branches, this movement takes you away from the caterpillar or pupa. The last thing you are going to do is go back into that mass of leaves to high-risk explore to see if you were fooled into leaving your lunch behind. These caterpillar and pupa (or chrysalis) false eyes appear to have been selected for through the value to the immature of eliciting a startle or fright response from the insect’s vertebrate predators, a startle response that has the consequence of passive or active escape by the insect. Visual mechanics are on the side of the caterpillar or pupa. The foraging bird will most commonly first see the caterpillar or pupa’s false eye(s) through one eye or the other. This way it is almost impossible to determine if an eye is a 1 mm diameter harmless eye at a distance of 3 cm, or a 3 mm diameter dangerous eye at a lethal distance of 9 cm. Further, with one visual field it will be hard to see the 3-D traits that could help distinguish a predator’s face from an eye spot on a caterpillar. The color and pattern antecedents for false eyes lie in the camouflage and warning colors found throughout insects, caterpillars and pupae included, and in serendipituously eye-shaped structures such as spiracles. It appears that there is not so much a selection driving a false eye to match some particular real eye, as is often the case with Batesian and Mullerian mimicry (where there is selection to match a specific model). Instead, many kinds of false eyes will suffice if they are eye-like enough in appearance to elicit the startle/flight response that all small vertebrates must have if they are to survive for decades in a predator-rich tropical forest. Startle mimicy functions not through learning by the predator, but rather through expression of genetic programming somewhat analogous to the genetic programming that leads a bird to avoid a bright-colored ringed coral snake and its mimics. Viewing the false eyes on caterpillars and pupae as startle mimicry suggests the possibility that the eye spots on many adult butterfly and moth wings may well also function in the same manner. However, this suggestion is not meant to negate or exclude the possibility that in some species such eye spots on wings (also) function to cause a butterfly-seeking bird to target such an eye spot, thinking that it is the vulnerable head of the butterfly. Such deflection of a strike towards a false eye would not, however, raise the fitness of a caterpillar or a pupa.